Ha! Ha! Just kidding. We all share the load around here (or at least strive to). Last summer, I searched the net to try to figure out a system for having the kids do chores around the house. There are many great systems and ideas, but it’s important that you find something that will work for your family. In my case, I sometimes find that the trouble with a system is actually me, not the kids. When jumping into anything new, you truly have to commit. I am often a great starter, but am not always committed entirely to the process and thus over time, it fails. So, when considering a chore system, I wanted it to be manageable for the whole family, so that it would with stand the test of time. I am trying very hard to be “a little, a lot person” instead of “a lot, a little person”. You know what I mean… “do little things” and make small changes, but make a big, long-term commitment instead of trying to do things in such a big way that you end up losing momentum and feeling like a failure. Originally, we planned to set up bank accounts for each of the children and then arrange to have a direct deposit come from our account to each of their accounts on a weekly basis. My thinking was that this would avoid the issue of not having cash on hand to pay the kids on allowance day. In the end, we never got our act together and decided that cash was preferable, so that we could teach them money management as well. The whole issue of allowance is one we have gone back and forth on. There are many experts on the subject, all with varying opinions – to pay or not to pay – that is the question! We decided that we like the idea of the kids learning to manage their own money and to begin the process of tithing 10%, investing 10%, saving 10% and using the other 70% as they wish (within our family guidelines, of course). This way, they will learn the value of a dollar and have the opportunity to learn about both good and bad choices. We have a little corner store at the end of our street and the neighbourhood kids love to walk down for treats. I sometimes find it difficult to keep track of how often they go, especially during the summer. This way, they can go if they have money left and will have to pass if they are “tapped-out”. In the past, I would often say “no” when they asked to go, as I am always trying to avoid over indulging and spoiling our children. As a result, I am always trying to keep the balance between being fair (and letting them get a treat) versus being a good parent and not spoiling them. Thus, we decided to give them a little more freedom to make their own choices and learn from their own mistakes. They will receive 50 cents per year or an amount equivalent to half their age. So, our 11 year old gets $5.50 per week and our 9 year old gets $4.50. Not a huge amount, but enough to begin to make some of their own choices. We don’t really pay our kids their allowance based on doing chores, but there is an expectations that they must pull their weight as a member of our family. I used a combination of ideas from several sources and this is what I came up with. 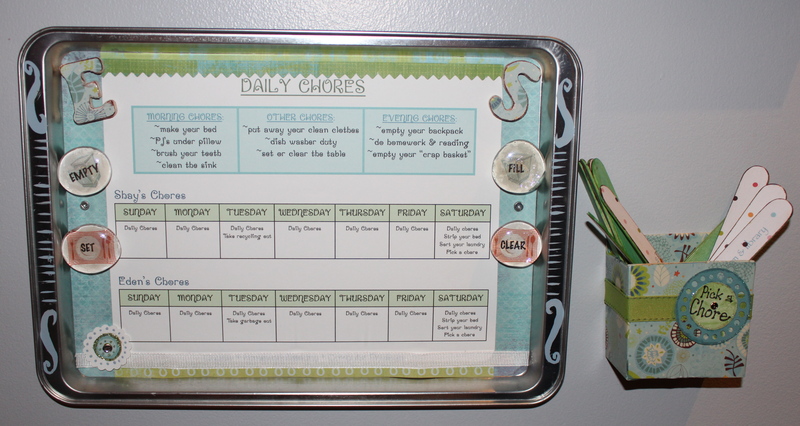 Using a dollar store cookie sheet, I covered the surface with some scrapbooking paper, typed out a list of daily chores as well as a weekly schedule for each child and printed it out on cardstock. I bought wooden letters to represent the kid’s initials and covered them with coordinating patterned paper. I then used large glass beads to create magnets for both the dishwasher and the table. 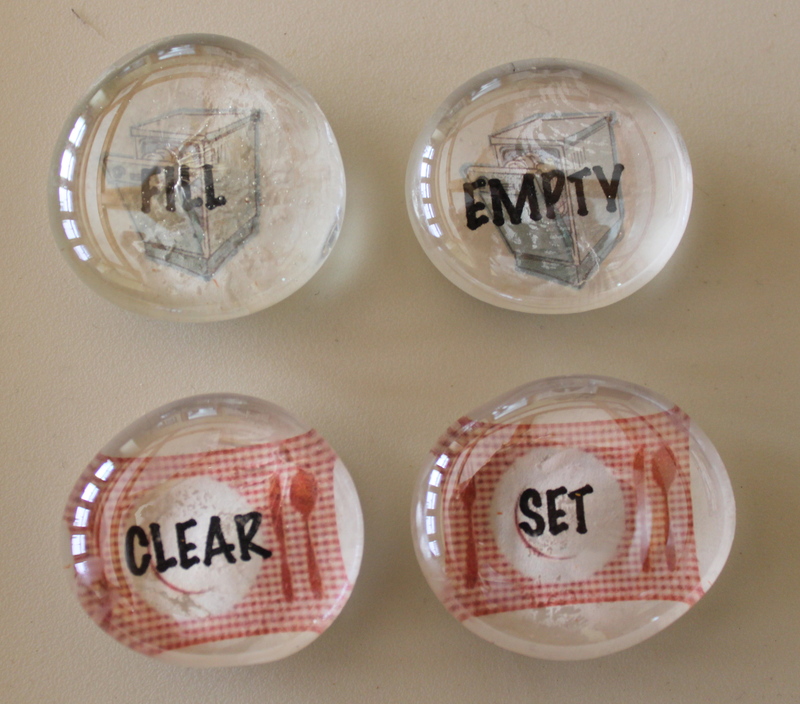 The EMPTY/CLEAN and SET/CLEAR magnets switch each week. So, in addition to the kids regular daily routine (make bed, brush teeth, clean sink, empty backpack, do homework/reading, empty “crap basket” from the stairs), they are also responsible for putting away their clean laundry, dishwasher duty and either setting or clearing the table. Our Garbage and Recycling are picked up on Wednesdays, and the kids are also responsible for taking both out throughout the week when needed as well as moving the bins out on Tuesday evening, so they are ready for Wednesday pick-up. On Saturday mornings, the kids do their regular daily chores, but instead of making their bed, they strip the sheets/pillow cases for washing and I help them make their bed with clean bedding. They are also required to “pick a chore“. I got the idea from whateverdeedeewants.com, but modified the chores to meet our family’s needs. We started with just one extra chore per week, but the kids have been told that there are times when they will be asked to pick 2 or 3. 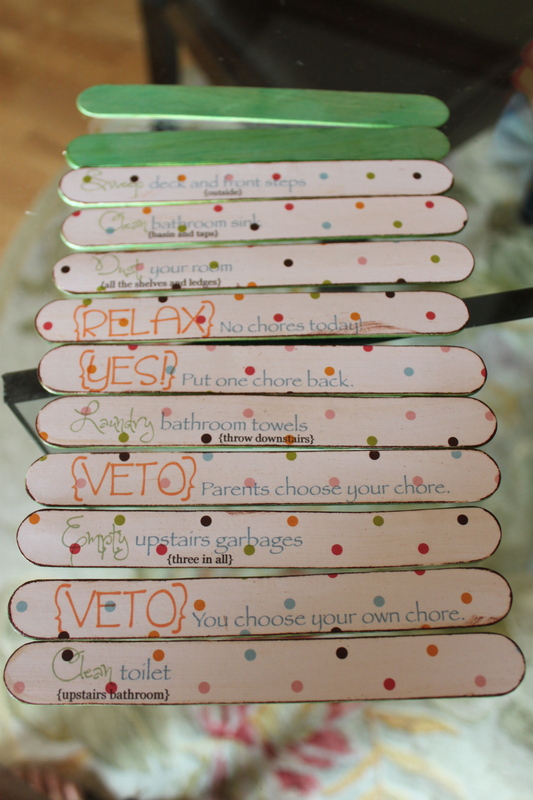 They still have an opportunity to “put a chore back” or “relax” and be chore free, if they pick a lucky stick. I needed a place to keep the chore sticks, so I upcycled this creepy little clown box that I bought for a quarter at a garage sale specifically for this purpose. 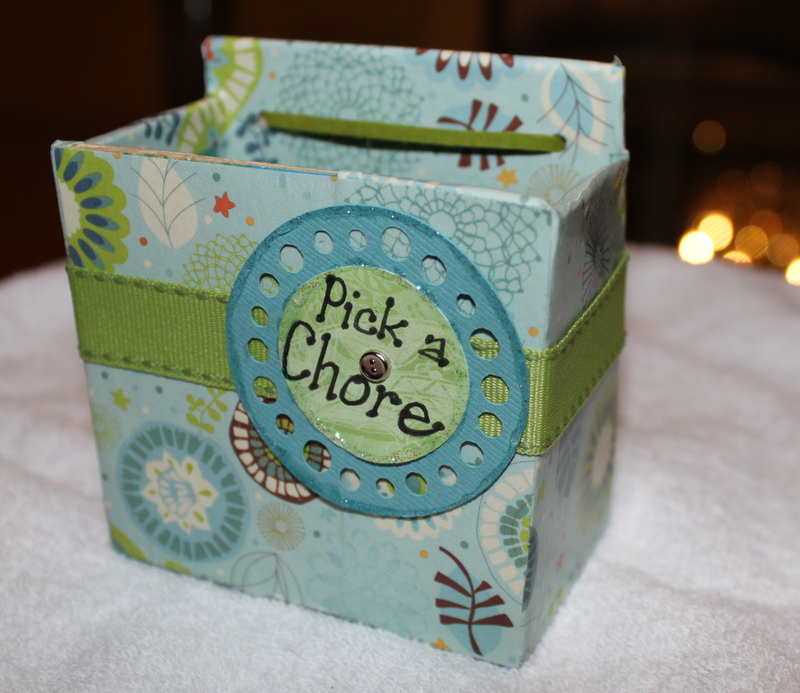 I cut down the box to square it off and used the paper that coordinated with the rest of my family center (Weekly Calendar and Magnetic Chore Tray) to make a cute little holder for our Chore Sticks. 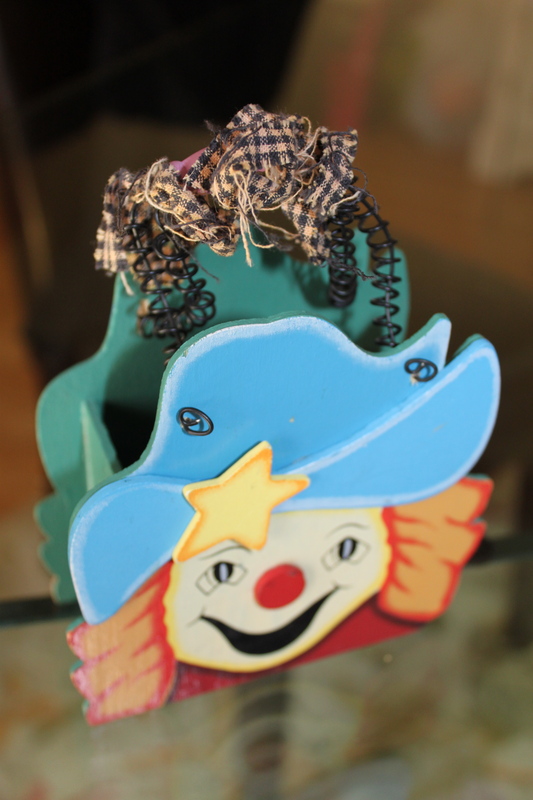 Upcycled clown box, turned into a cute little wooden holder for our chore sticks. I used some vintage clip art and printed little “icons” for both the dishwasher and table jobs. These were made from dollar store jumbo glass beads and craft magnets. They stick to the magnetic chore chart. We hung the chore system up below our Weekly Family Schedule. We used the above system all of last year and it worked well. I did find that Saturday chores were sometimes difficult to stay on top of because of the various activities that we are always running to. I have not made any changes to the system yet, but our kids are at the age where they are asking how they might be able to earn some extra money. I have a few ideas swarming around in my head, so I will keep you posted if I incorporate some of the ideas I am thinking about. I must admit, I sometimes find “chores” a hassle. I could empty the dishwasher in 2 minutes, instead of waiting the 20 until my daughter is out of the shower (or whatever). The garbage is bagged and ready to go, why not just slip it out on my own? Remember…chores are not just about helping out, they are about teaching responsibility and learning valuable life skills that a future spouse will really appreciate. I don’t demand that their beds are made perfectly or that the everything is done exactly the way I would do it, but as they grow and mature, I give them little tips that can help them become more effective and efficient with the tasks they do. Good luck! 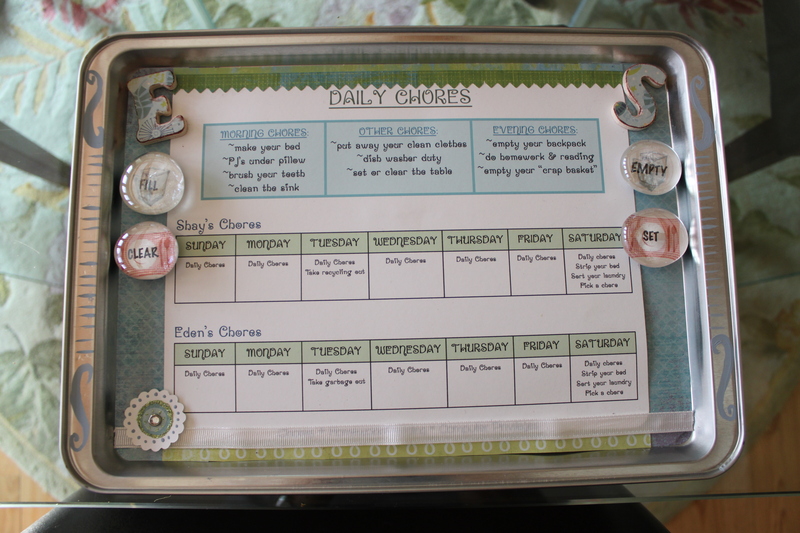 Posted on September 2, 2013 by Cindy Roy •	This entry was posted in DIY and Upcycling, Family, Organization and tagged chore, chore chart, chore sticks, chore system, chores, chores for kids, kid's chores, many hands make light work. Bookmark the permalink.